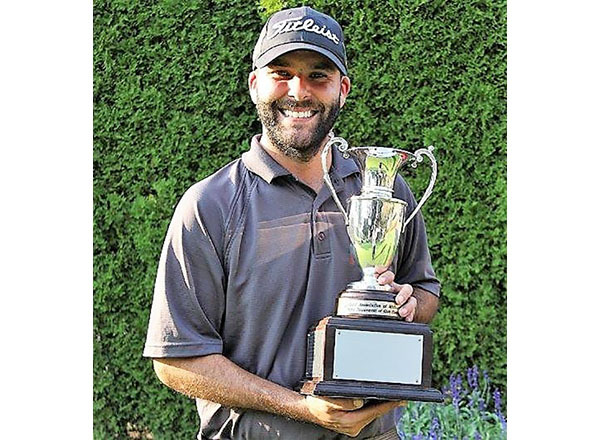 Even though he had never golfed on the north course of the Detroit Golf Club... even though he was up against some pretty stiff competition... even though there was a 2-hour fog delay... even though he had to fight through a tense, four-hole, sudden-death playoff... 2016 HFC alumnus Jake Kieronski overcame the odds and won the Golf Association of Michigan (GAM) 2018 Tournament of Champions title Oct. 8. The Detroit Golf Club, he said, is first-rate. Kieronski birdied the No. 1 hole three times, including twice in a three-man sudden-death overtime playoff that extended to four holes. He shot 2 under 70 in regulation play, which left him tied with Battle Creek Country Club champion Bill Johnson and GAM Mid-Amateur champion Scott Strickland. For the playoff, Kieronski and Johnson each birdied No. 1, while Strickland was eliminated with a par. Kieronski and Johnson then tied on hole 2 with pars and hole 9 with bogeys. This set the winning birdie back up at No. 1 for Kieronski, who earned his first GAM title. Kieronski described what he felt the moment he realized he won the tournament. Kieronski, who is currently an independent insurance agent for the KSP Agency in Wyandotte, attended HFC on a golf scholarship. He earned his associate degree in business administration in May of 2016. Three days later, Kieronski won the Michigan Community College Athletic Association (MCCAA) Individual Championship title for the second consecutive year at the State Tournament in Port Huron. “It was an all-around beautiful day,” recalled Kieronski. For the last two years, he has been the head golf coach at the Summit Academy North High School in Romulus. Still riding high from his GAM championship, Kieronski is setting golf aside for the moment.